WorldofVolley :: ITA M: Trentino too strong for Modena, Perugia keep the top position! 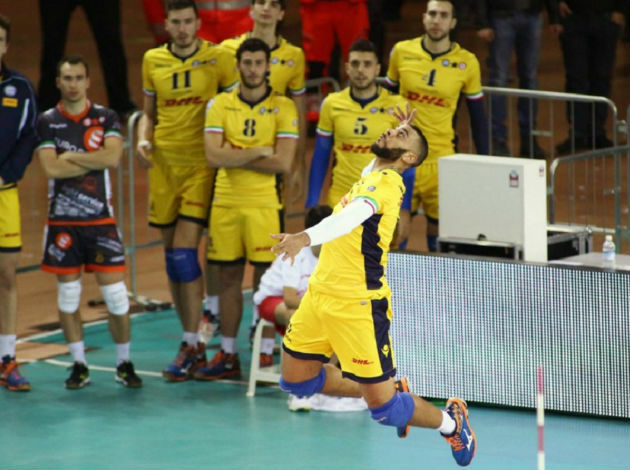 ITA M: Trentino too strong for Modena, Perugia keep the top position! In a match of the round, Trentino defeated Modena on the road without any difficulties. The away side finished the game in straight sets 25-19, 25-17, 25-22. Uros Kovacevic (15 points), Luca Vettori (14 points) and Aaron Russell (14 points) led Trentino to the victory, leaving the opposite players empty handed since there were no players with double digits. Perugia have managed to stop Sora’s Dusan Petkovic who was in the mood for this game. The Serbian opposite ended the game with 21 points, but on the other side, Wilfredo Leon had 21 and Aleksandar Atanasijevic 18 points. Lube Civitanova have also scored the win. Castellana Grotte didn’t have any chance against Lube, a team that has been led by Tsvetan Sokolov (19 points). Nimir Abdelaziz had a great game in the win of his team Milano over Vibo Valentia. The former setter scored 27 points.